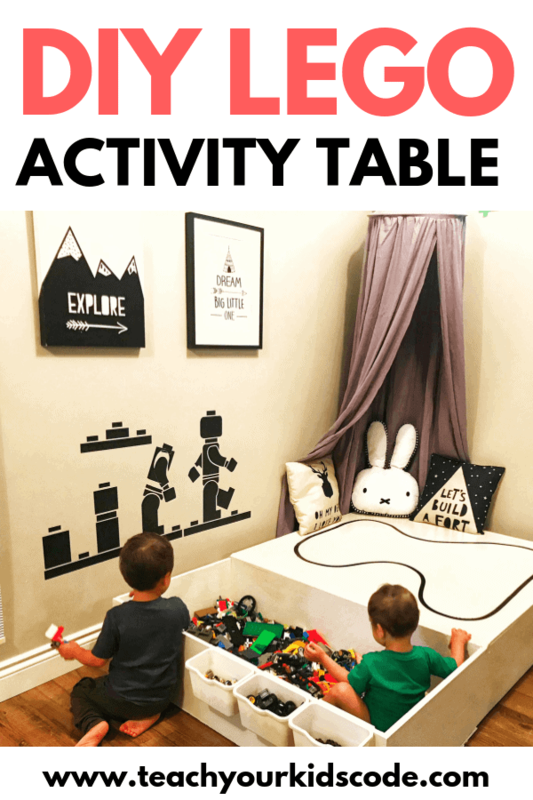 A lot of readers have been asking me about our LEGO activity table! 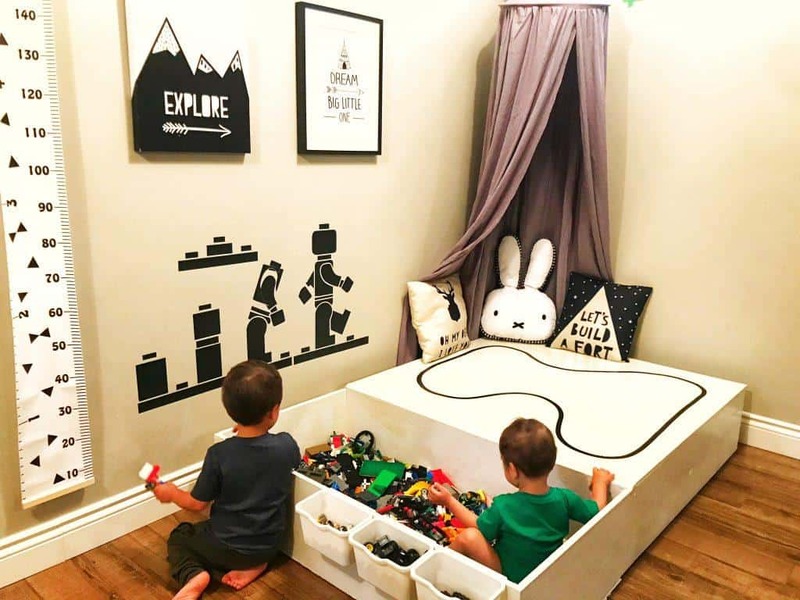 I’ve decided to hop on the blog today to share how we built our DIY LEGO table for kids. I absolutely love our LEGO table, which we have also made a coding space for our robotic toys. It is so versatile and perfect for a variety of activities. We do a lot of our coding projects on the table, and our kids are known to break out into song and dance on the ‘stage’ as well. It was a great project, and well worth the effort! This is actually our second LEGO table. Before this table, I had modified an IKEA hack I found online to create an organized LEGO table. I spent HOURS painstakingly sorting all of our 1000s of LEGO pieces by color. I made a printable with all of the LEGO colors so I could organize everything just PERFECT. This is what our LEGO table looked like 99% of the time. Our previous LEGO table was a disorganized mess! 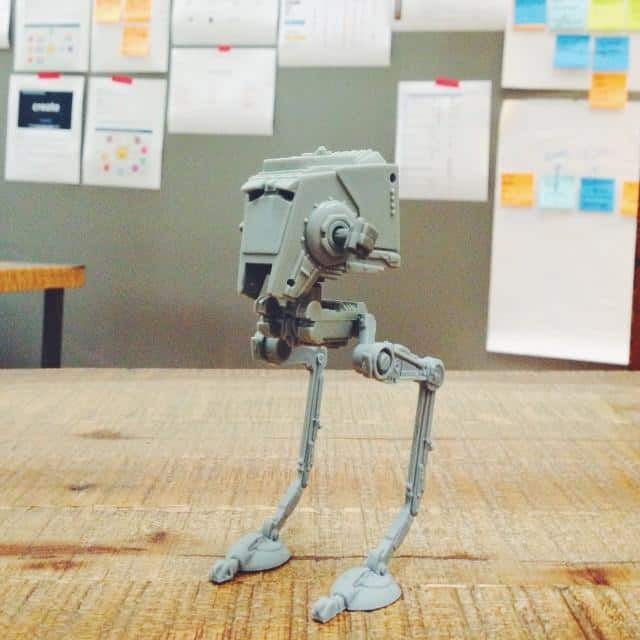 So I decided to rethink our LEGO table design! I knew I wanted something that would hold a LOT of LEGO. My parents kept all of my childhood LEGO so we have quite the collection in our house. I also wanted a large playing surface that would be multipurpose. I wanted to be able to do our coding activities on the table, and use it for all our other STEM activities like making slime and having fun with sensory bins. 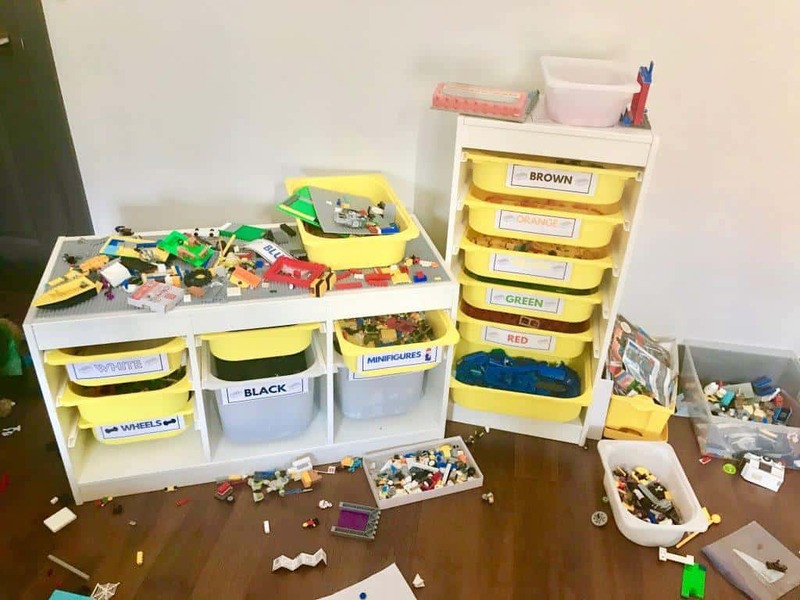 The most important feature of our DIY LEGO table was that it needed to require VERY LITTLE organization. At the end of the day, neither I or my kids were going to keep the LEGO sorted by colors. I figured that it made sense to have a few specific organizing containers for minifigures and wheels but that is the ONLY organization that our table has. First off, I am not a DIY expert. 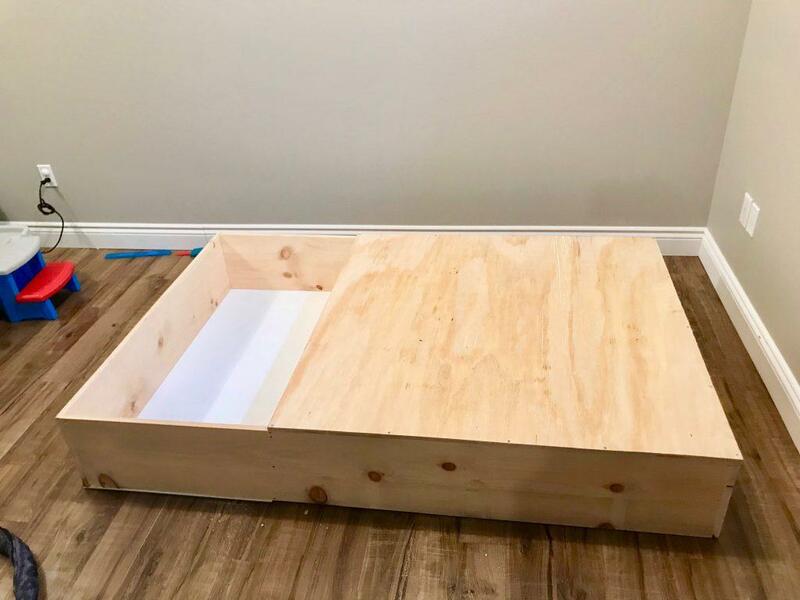 In fact, I have adjusted the plan in this post to fix a few of the small mistakes I made when I first built this table. When I came up with the design for the table, I wanted it to be as easy as possible. This is why I used precut wood that I found in my hardware store. This project only requires TWO simple cuts, and I had the guy at the hardware store do it for me. The total time to complete this project was between 4-6 hours. White paint and primer in one! Using wood screws make a large rectangle with your two 6ft boards and your two 4ft boards. VERY IMPORTANT, you want the two four foot boards to be the OUTERMOST boards. These boards should sandwich the 6ft boards. Step Two: Nail the 4 ft x 4ft thin hardboard to the underside of your frame. I then used a nail stapler to insert small bradley nails into the baseboard on the underside of the wooden frame. If anyone has ever put together an IKEA bookshelf, you will know this step well! 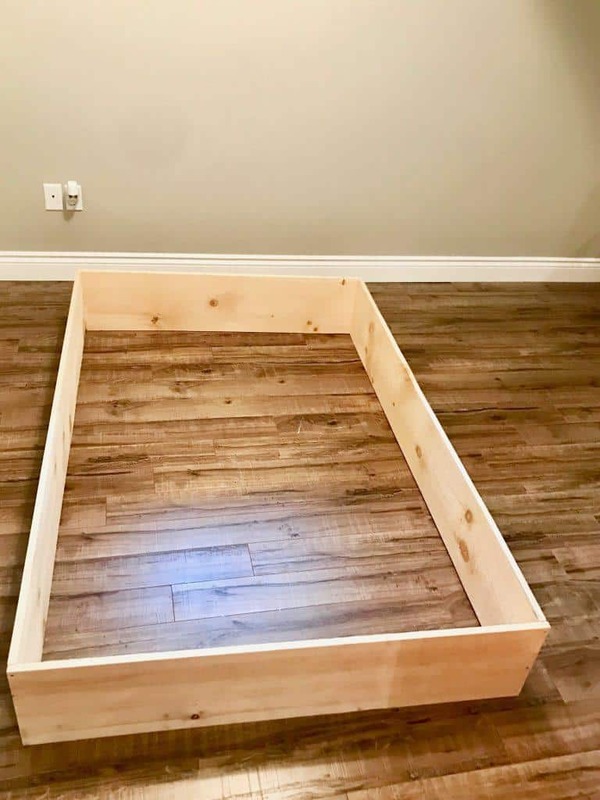 In my project I used a 4ft by 2ft hardboard, however, I found that I had a 1inch gap and so I have adjusted these instructions to 4ft x4ft (as this is the pre-cut standard). This will leave an overhang of extra material. 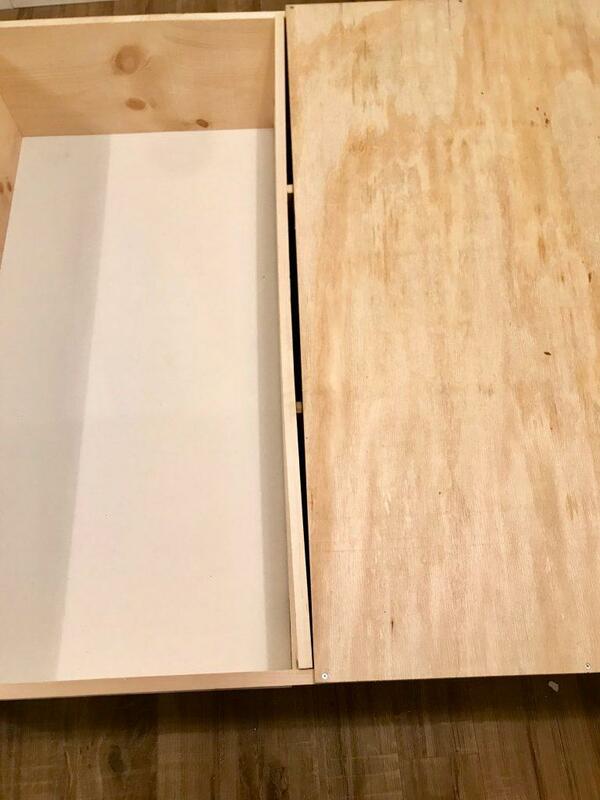 Step 4: Use a shorted 1x4ft pine board to divide the compartment. This is where I ran into trouble on my initial table, and why I have adjusted the instructions to use a larger hardboard for the bottom of the table. The next step is to take a shortened 1x4ft pine board and use it to divide the LEGO space. 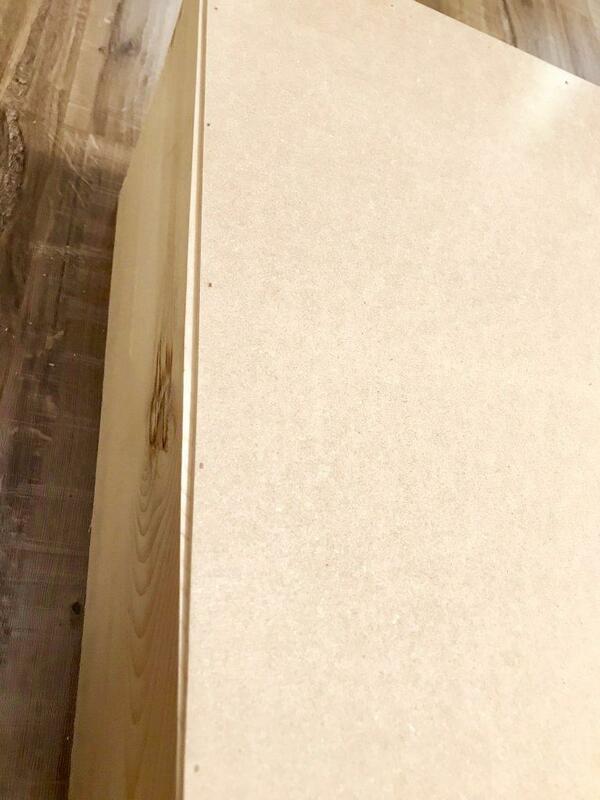 With a longer hardboard you will be able to tuck this piece UNDER the 4×4 top board and use wood screws to fasten it to the top and sides. You will require your 1ft x4ft board to be SHORTENED by the thickness of two boards. I asked my hardware store to cut this for me. Flip over your frame so that your table is upside down. Where the backboard drops off (overhangs) add in a second shortened board to provide support for your table. This will allow your kids to comfortably step on the table. Use wood screws to fasten it into the frame. Prep your table for painting by lightly sanding the entire thing. This step is extremely important for a good quality paint job, so do not miss it! We have this hand orbit sander and it is SOO useful for any refinishing projects. We used a paint-and-primer in one to paint our LEGO table. Two coats were perfect and I am really happy with how our table turned out. Make sure to put down some tarps on your floor to protect from paint splashes. 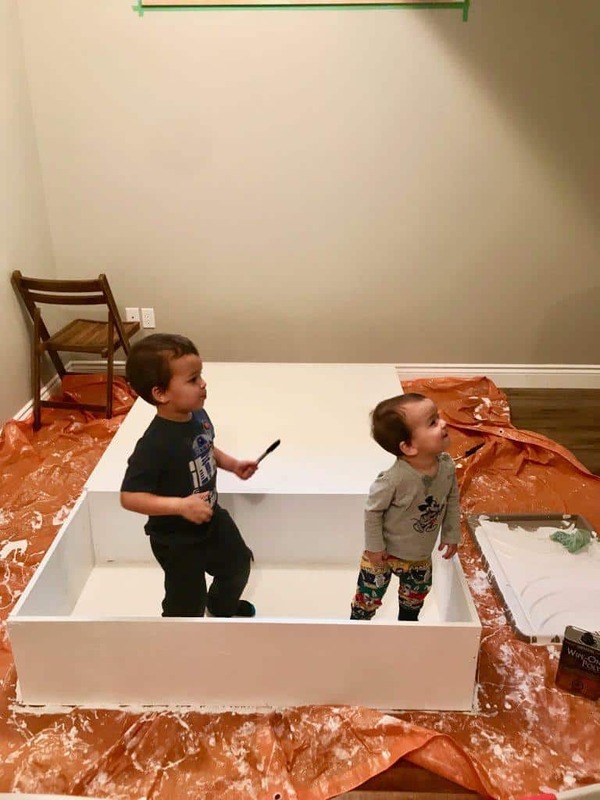 I got my son involved in the painting and he had a blast! After the paint dries, we added a coat of wipe-on poly. This will give your table a smooth polished finish and protect it from any spills or stains. For our coding space, I used electrical tape to make the kidney-shaped pattern on the top of the large platform. This is great for robotic toys that can be programmed to follow dark lines, like the Edison Robot. And voila! Here it is! Our LEGO table. I LOVE this table and am really happy with how it’s turned out. 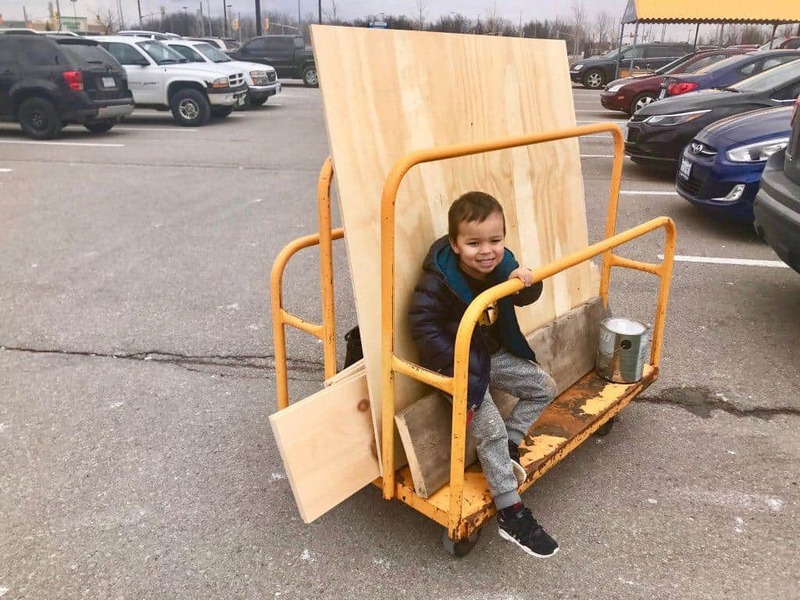 It’s very versatile, sturdy and the kids LOVE it. I am so happy I changed over from the organization nightmare I was in before!